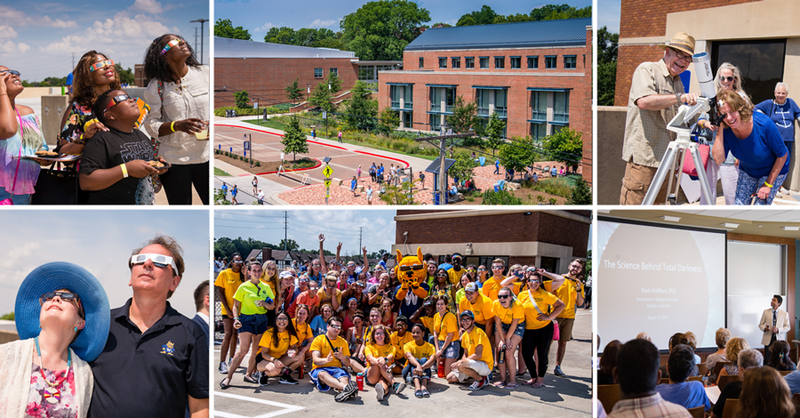 The 2017-18 academic year at Webster University was another one to remember. It began with big events, the largest-ever first-time frehsman class in Webster Groves, and a major federal grant. In the summaries, videos and links below, relive a sampling of highlights in the achievements and community engagement of the students, faculty, staff and alumni who make up this global community. The total solar eclipse brought more than 800 people to campus in August. Community members across departments and units came together to host an engaging and educational community party for the Aug. 23 solar eclipse, the first to cross the continental United States from coast to coast since 1918. See video and more from the total eclipse event in this story. The eclipse came and went while planning for the next major event was well underway: In October Webster formally dedicated Browning Hall, the interdisciplinary science building, with a ceremony, academic symposium and faculty panel. That event followed news -- and widespread media coverage -- of the School of Education securing a $2.7 million federal grant for educating teachers of English Language Learners. The five-year grant will allow 120 St. Louis area public school teachers to complete work required by Missouri for certification to address this growing regional need. In the spring, more than 300 guests gathered to emphasize the importance of scholarship support at the annual scholarship dinner held by Advancement. Webster has tripled the number of Presidential Scholarships awarded over the past two years. Geneva student Aya Abdullah was featured in a video with United Nations High Commissioner for Refugees (UNHCR) Goodwill Ambassador Cate Blanchett for a live event during the World Economic Forum, sharing her experience as a refugee from war, twice, before arriving at Webster. U.S. Air Force officer and Webster alumna Julie Yanagihara shared her experience earning an MA in Management and Leadership, thanking faculty, advisors, mentors and friends for helping her juggle pursuit of a Webster degree while advancing her military career and raising a young family. The Tau Sigma National Honor Society inducted 32 more Webster transfer students. This profile of three transfer students provides a glimpse into their experience and why they chose Webster. Two Fulbright Scholars from Afghanistan reflected on why they chose to continue their education at Webster to help prepare them to make a bigger impact in their home communities. Students also shared "a week in the life..." experiences through one-week "takeovers" of Webster Instagram accounts like @MyWebsterU and @websteru_studyabroad. For the 17th time in 20 years, Webster University Athletics captured the St. Louis Intercollegiate Athletic Conference (SLIAC) All-Sports Trophy, recognizing excellence across its sports programs. During, the 2017-18 season, Webster took home SLIAC titles in women's soccer, women's cross country, men's golf, baseball, women's tennis and women's track and field. Women's basketball also won the SLIAC tournament, while several teams and individuals earned all-academic honors for work during the previous year. The chess team broke its own record with a sixth consecutive Pan-Am championship, though it fell a half point short of extending its record run of five consecutive President's Cup victories. Jake Bennett, an international relations student in St. Louis, won a coveted international internship for young professionals in Germany. ... Eight students participated in the STLAURS undergraduate research conference where four Webster faculty members were judges, with two students receiving an award for their presentation. ... Two nursing students and one alumna received St. Louis Magazine Excellence in Nursing awards. ... Communications students were honored at the regional level of the National Advertising Competition, while The Journal student newspaper won regional awards from the Society of Professional Journalists and Missouri state awards from the MCMA. 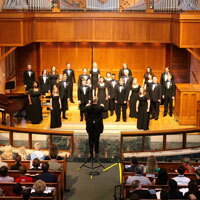 ... Music Education students swept top honors at the NATS competition, while the Chamber Singers performed to rave reviews as one of 10 collegiate choirs selected to perform at the biennial National Collegiate Choral Organization (NCCO) gathering. ... Recent alumna Kat Goldenreceived a prestigious National Geographic fellowship. ... George Herbert WalkerSchool of Business & Technology students at Webster Jacksonville were runners-up in the global Capsim Challenge, competing against students from 224 universities across 19 countries. The Alumni Association announced its 2018 Outstanding Alumni recipients, honoring Jennifer Johnson Cano, Congresswoman Val Demings, Matthew Horn, Tom Lange and Al Merschen. Two alumni were named to the St. Louis Business Journal 40 Under 40 list, while a student and an alum were also named to its 30 Under 30 list. Meanwhile, Webster Athletics inducted five more alumni into its Hall of Fame. Doug Finlayson, Eric Flack, Henry Garcia and Mary Preuss received the William T. Kemper Award for Excellence in Teaching. Jeffrey Carter received the Wilma and Roswell Messing Jr. Faculty Award. Externally, faculty, students and alumni were all represented among the honorees at the St. Louis Theater Circle Awards. ... English Professor David Clewell received the 2017 Lifetime Achievement in the Arts award from the Webster Groves Arts Commission. ... Craig Miller in Finance and Administrationwas honored by the St. Louis Business Journal's Diverse Business Leader Awards. ... Associate Music Professor Kim Portnoy was one of 10 artists in the St. Louis region selected to receive a $20,000 fellowship from the Regional Arts Commission. ... Vienna's Marc Mehu secured a € 640,000 research grant from France and Austria to study nonverbal indicators of implicit prejudice and discrimination in inter-group relations. See more faculty and staff individual achievements through the News Around Webster tag. The Conservatory 50th Anniversary was a hit throughout the performance season, culminating in a moving weekend welcoming back alumni for a special ensemble performance and events looking forward to the next 50 years. See more pre-event interviews like the one above, event highlight videos and photos and more through the links in this post. Last summer faculty led study abroad with a research component to the Webster campus in Accra, Ghana, opening the eyes of students and charting new opportunities in study abroad. 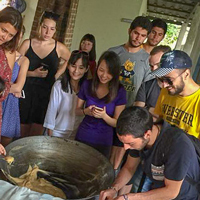 Over spring break when 33 students took advantage of short-term hybrid offerings to study in Greece, Costa Rica, Cuba and the Galapagos Islands. An innovative School of Education program this spring immersed future teachers in Leiden schools. Winning Approaches for Talented Transfers in STEM (WATTS) Scholarship recipients met with scientists at Cofactor Genomics and heard career advice as part of a Career Development Tour coordinated by the Career Planning and Development Center and Biological Sciences faculty member Mary Preuss. For the second year in a row, Webster University was named to the Phi Theta Kappa Honor Society Transfer Honor Roll for its work in helping students transfer from community colleges. For the 26th consecutive year, Webster was cited as first among nonprofit and public institutions in awarding master's degrees to African Americans, among other distinctions of diversity and inclusion. The Community Music School was honored for its early childhood education program. The CMS was also awarded another National Endowment for the Arts grant for its Prep program. At Webster Athens, “The Defense Attaché Lecture Series” course brought high-ranking military experts and diplomats from several countries to campus to help students understand the thinking behind these key leaders. Webster's Global Leadership Academy received two awards at the 38th annual LEAD Awards. ... The Webster Wellness program was one of 10 UHC national award recipients recognizing outstanding committment to workplace wellness. ... Webster's sustainability efforts were honored with a Merit Award in the St. Louis Green Business Challenge. ... The Centre Francophone was named a Center of Excellence by the French Embassy in Washington, D.C. In the latest round of support for faculty research, 22 faculty members received Faculty Research Grants for 18 projects. Webster continues to help many of these stories reach a wider external audience to raise awareness of the University, through the efforts of campus marketers and public relations outreach in Global Marketing & Communications, as well as through faculty experts who are sought by media. Just a few examples: The Conservatory's anniversary and the impact of the arts in St. Louis and on the economy were highlighted in several regional media outlets. ... Similarly, media turned the spotlight on the annual Diversity & Inclusion conference and the English Language Learners grant. ... The Vienna campus was featured on Austrian national television as it hosted a panel with refugees of the Syrian war. Global Marketing & Communications earned accolades for some of these efforts, including industry awards for promotions of the Conservatory's 50th anniversary and the opening of Browning Hall. 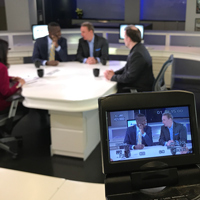 See more news media coverage featuring Webster and its people -- on outlets ranging from the Associated Press to U.K. media and public radio -- through the In The News newsroom tag. Ghana: "MeToo from an African perspective"
The eclipse event that opened the year was one of scores of community engagement events at campuses throughout Webster, welcoming guests to campus or reaching out to engage other groups and organizations that are vital to the local community. 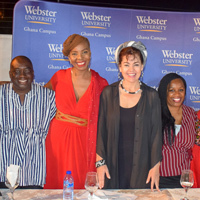 The lecture series at Webster Ghana included a riveting evening of guest and faculty speakers on "#MeToo From an African Perspective." That followed MeToo movement founder Tarana Burke's visit to the main campus. The Webster Groves campus also hosted Sandra Yancy McGuire as the fifth annual William T. Kemper Speaker on Excellence in Teaching and Learning, as well as Robert Musil as the visiting Woodrow Wilson fellow and author Sidney Blumenthal as part of the Contemporary Conversations series. Reaching outward, Webster University Dance Residency students worked with teachers and theatre students at Webster Groves High School. ... Professional Counseling students went to Jefferson City to advocate on Student Legislative Day in the state capital. ... The College of Arts & Sciences hosted the Academy of Science - St. Louis Science Fair in Browning Hall. ... The School of Communications also partnered with Academy of Science - St. Louis for a STEM communications careers day. ... In the fall Webster welcomed Buddhist monks from the Drepung Gomang Monastery for the creation of a sand mandala [see video] that was open to the regional community. ... The Walker School hosted the Cyber Explorers workshop for girls in partnership with MasterCard. The Ghana campus partnered with the U.S. Embassy and the W.E.B Du Bois Centre to host Black History Month events. ... Leiden community members organized a "One Billion Rising" event to raise awareness of violence against women. ... Geneva's landmark International Humanitarian and Security Conference was again a massive success in its 23rd year. ... Athens hosted its third annual holiday party for refugees of current wars. ... Thailand community members partnered with a foundation that supports underprivileged and orphaned children. These are just a broad sampling of highlights from 2017-18. Follow more Webster news via the newsroom at news.webster.edu, and on social media channels like Facebook, Twitter, Instagram and YouTube. Share and learn about upcoming events at events.webster.edu.